The High Court of Justice overturned Wednesday the Central Elections Committee's decision to disqualify the Arab parties, Balad and United Arab List-Ta'al from taking part in the next Knesset race. The Central Elections Committee explained its decision by saying that since neither party recognized Israel as the Jewish homeland, they were not eligible to bid in the nearing general elections. Twenty-six of the committee's members were in favor of barring Balad from the elections, while 21 supported the decision to ban United Arab List-Ta'al. Adalah, the Legal Center for Arab Minority Rights in Israel, appealed the decision with the High Court of Justice, on behalf of both parties. Wednesday's appeal was heard before a nine-judge panel, as required by law: The petition filed by United Arab List-Ta'al on its disqualification was granted unanimously, while Balad's appeal was granted by a majority of eight, with Justice Edmond Levy objecting. Attorney General Menachem Mazuz, who was asked to prepare a brief on the matter for the court, said Monday that he saw no grounds to prevent the Arab parties from taking part in the elections. Mazuz' further noted that the decision to disqualify the Arab parties was based on "flimsy evidence." 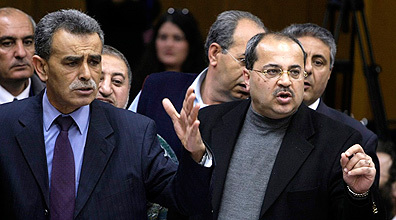 Knesset Member Ahmad Tibi (United Arab List-Ta'al) welcomed the decision: "We have beaten fascism. This fight is over but the battle is not. Racism has become a trend in Israel… the court's decision has righted a wrong by Kadima and Labor." Balad Chairman MK Jamal Zahalka reiterated the sentiment: "This decision is a blow to Lieberman and the fascist Right, as well as to Kadima, the Likud and Labor, which stood by the disqualification. "Balad stands by its platform. The court's decision is a victory to the Arab public and to anyone who seeks democracy… we call on everyone to back the notion of 'a people's state' and a life of equality and no discrimination." Yisrael Beiteinu Chairman Avigdor Lieberman condemned the court's decision: "(Former Chief Justice) Aharon Barak once said that democracy doesn’t have to kill itself to prove it was alive. The court threw that sentiment out today, and virtually gave the Arab parties permission to kill Israel's (character) as a Jewish and democratic state. "We will not give up," he added, "and we will make sure to pass the citizenship bill in the next Knesset. That will put an end to the disloyalty shown by some of Israel's Arabs." See all talkbacks "Arab parties win disqualification appeal "